Cable gland, PG-7, Ф6mm, IP68, polyamide Cable gland, PG-7, Ф6mm. Cable gland, PG-11, Ф10mm, IP68, polyamide Cable gland, PG-11, Ф10mm. List Price 0.30лв. VAT Incl. 0.27лв. VAT Incl. 0.24лв. VAT Incl. 0.21лв. VAT Incl. List Price 0.35лв. VAT Incl. 0.33лв. VAT Incl. 0.31лв. VAT Incl. 0.29лв. VAT Incl. 0.27лв. VAT Incl. List Price 0.44лв. VAT Incl. 0.42лв. VAT Incl. 0.39лв. VAT Incl. 0.37лв. VAT Incl. List Price 0.70лв. VAT Incl. 0.66лв. VAT Incl. 0.63лв. VAT Incl. 0.59лв. VAT Incl. 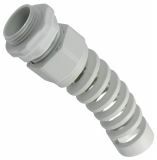 Cable gland, PG-7, Ф7mm, IP68, polyamide spiral tail PG-7 cable gland, mounting hole Ф14 mm, internal diameter Ф7 mm. 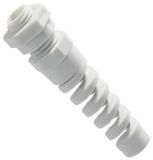 Cable gland, PG-9, Ф9mm, IP68, polyamide spiral tail PG-9 cable gland, mounting hole Ф16 mm, internal diameter Ф9 mm. List Price 0.99лв. VAT Incl. 0.93лв. VAT Incl. 0.89лв. VAT Incl. Cable gland, PG-11,Ф11mm, IP68, polyamide PG-11 cable gland, mounting hole Ф19 mm, internal diameter Ф11 mm. Cable gland, PG-13.5, Ф13.5mm, IP68, polyamide, spiral tail PG-13.5 cable gland, mounting hole Ф22 mm, internal diameter Ф13.5 mm. List Price 1.25лв. VAT Incl. 1.18лв. VAT Incl. 1.13лв. VAT Incl. Cable gland, PG-16,Ф16mm, IP68, polyamide, spiral tail PG-16 cable gland, mounting hole Ф22 mm, internal diameter Ф16 mm. List Price 1.50лв. VAT Incl. 1.44лв. VAT Incl. 1.35лв. VAT Incl. 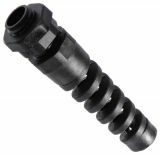 Cable gland, PG-16,Ф16mm, IP68, polyamide, spiral tail, black PG-16 cable gland, mounting hole Ф22 mm, internal diameter Ф16 mm. List Price: 0.70лв. VAT Incl. Cable glandis a mechanical device that is used to safely connect a cable to a panel or other surface. In this way the free end of the cable can be easily and quickly attached without tension or bending. Cable glands are four main types depending on the material: plastic, brass, aluminum and stainless steel. They are universal inputs for different types of cables: telecommunication cables, supply cables, installation cables, etc. 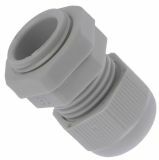 Vikiwat Ltd. is a direct importer and distributor of a wide range of PG standard cable glands with sizes from PG7 to PG 36.